—Diddy Kong, Donkey Kong Country 3: Dixie Kong's Double Trouble! The Northern Kremisphere is the name of the area Dixie Kong and her cousin Kiddy Kong travel through in Donkey Kong Country 3: Dixie Kong's Double Trouble! and Donkey Kong Land III. As evidenced by its landscape, the Northern Kremisphere is a broad region with a temperate to frigid climate, rather than tropical as on Donkey Kong Island. 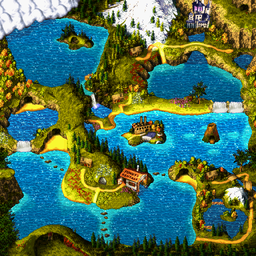 Due to the large number of lakes, navigation across Northern Kremisphere is done by various watercrafts which can be obtained at Funky's Rentals. The flora of the Northern Kremisphere adheres to its climate, being composed of numerous species of redwood and fir trees dominating the mountains, plateaus and plains. For the most part, the nature in the region is well-preserved, but the industrial Kremling constructions have generated pollution in select areas such as Mekanos, now filled with pipelines, warehouses, and lumber mills. Months ago after Crocodile Isle disappears from the map, the mainland is invaded by Kremling remnants where they build their industrial bases. When Donkey Kong and Diddy Kong go missing for two days, the entire mainland is dominated by the Kremling Krew where their robotic leader, KAOS, is created. During the events of Donkey Kong Country 3: Dixie Kong's Double Trouble!, Dixie and Kiddy Kong travel to the Northern Kremisphere in search of DK and Diddy and to investigate the recent appearance of Kremlings there. In their quest, they travel through many places, from the serene Lake Orangatanga to the freezing summit of K3, and eventually discover Krematoa, a secret island revealed from the depths of Northern Kremisphere's waters. Eventually, Dixie and Kiddy defeat King K. Rool for the last time, freeing the islands from the Kremlings' control and saving DK, Diddy and all of the Banana Birds. In Donkey Kong Land III, Dixie and Kiddy return to the Kremisphere to search for the fabled Lost World. In their journey, they explore several new areas, such as Cape Codswallop and Primate Plains. The Northern Kremisphere, despite its name, is located to the south of Donkey Kong Island. The region is within swimming distance of Donkey Kong Island, and is the nearest mainland to the south of the island. Given its proximity, and the fact that Wrinkly Kong and other members of the Kong Family live in the region, it is possible that the Northern Kremisphere is part of the greater chain of DK Isles. This is also supported by the fact that Kocos are stated to patrol the waters of Donkey Kong Island, despite only appearing in the region explicitly labeled the Northern Kremisphere. The name "Northern Kremisphere" is a pun on the Northern Hemisphere, the top half of Earth. According to the game's official Player's Guide, a supposed, in-universe rumor claims that Cranky Kong covered all of the levels in the Northern Kremisphere and found everything by five hours and fifteen minutes. This page was last edited on February 26, 2019, at 13:49.